On our second full day in BVille, we once again decided to venture out for breakfast. It was a Sunday so we knew we had to arrive early in order to avoid the church crowd. For this trip, we went to the Blairsville Restaurant. We have been visiting my gparents in BVille for almost 10 years and this was our first visit to the Blairsville Restaurant. When we first arrived, we found it to be basically empty besides one other table. Walking in was like walking into history. The inside look and feel of the place reminded me of television – something straight out of a 1970s sitcom. I was a bit concerned but, hungry and it smelt good. I found my way to the table and was prepared to be Transported Back. After reviewing the menu, and the optional breakfast bar, I decided to go with the French Toast. I did think about the breakfast bar – which included eggs, meats, potatoes, grits, biscuits – but then realized I would just get overly full from loading up the carbs. By selecting the French Toast, I limited myself to a few slices of heaven. While I am a big french toast fan, it is something I rarely ever eat. I never prepare it at home and we usually never go out for breakfast. After waiting maybe 15 minutes or so, our plates arrived. 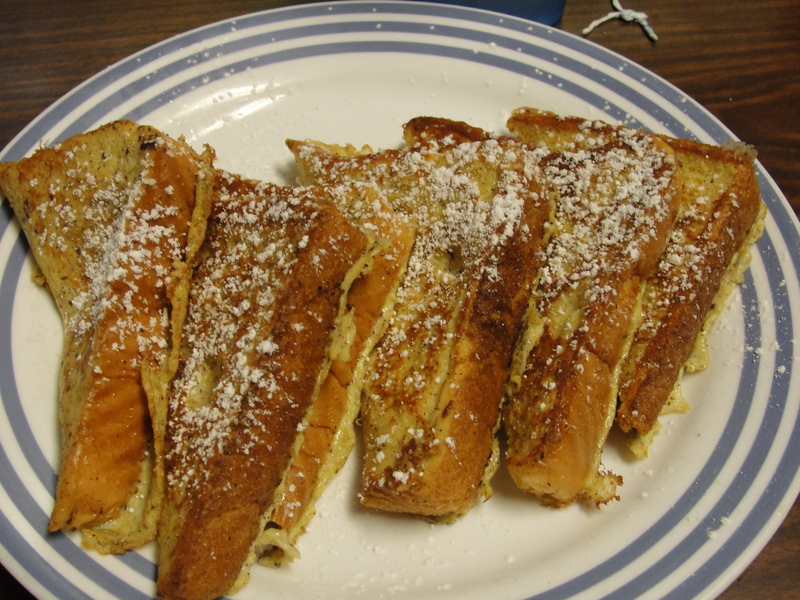 My slices of french toast, with their sprinkle of powered sugar, looked simply divine. 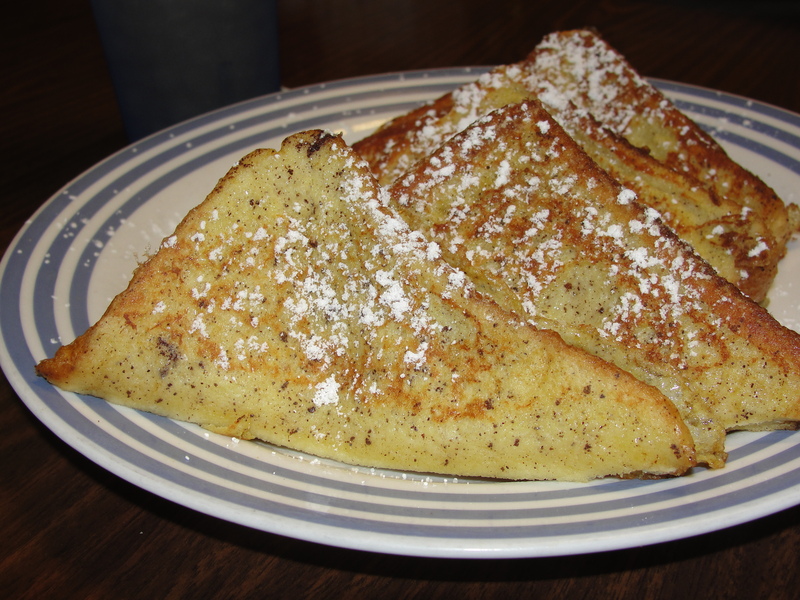 I sometimes find the taste of french toast to be way too eggy, and was a bit fearful when I first saw the french toast. I could see the outline of the eggs on each piece, placed nicely on my vintage plate. I cut into my first piece and ate it as it was. Mmm…it sure was good. The exterior was slightly more well done than the interior and the interior? Ohh my was it good. Super creamy and soft, it was like putting a pillow in my mouth. There was a slight buttery taste baked within each and every piece. And, lucky for me, there was no eggy taste. As I continued to eat, I dipped some of the french toast into syrup. This made it taste even better. The contract in extreme sweetness & soft pillows, just exploded in my mouth. Every single bite was just as good as the one before it. As I came up to my final piece, I was totally wishing I had a ton more. Even though I was beginning to get pretty full, the flavors were just so amazing. By far, this was some of the best french toast I have ever had. I may have been in the 70s but the flavor was totally in the now. After finishing my plate of goodness, I got to try the biscuit that Mommy received with her meal. I found this biscuit to be head and shoulders over the biscuit I had the day before at Cook’s. 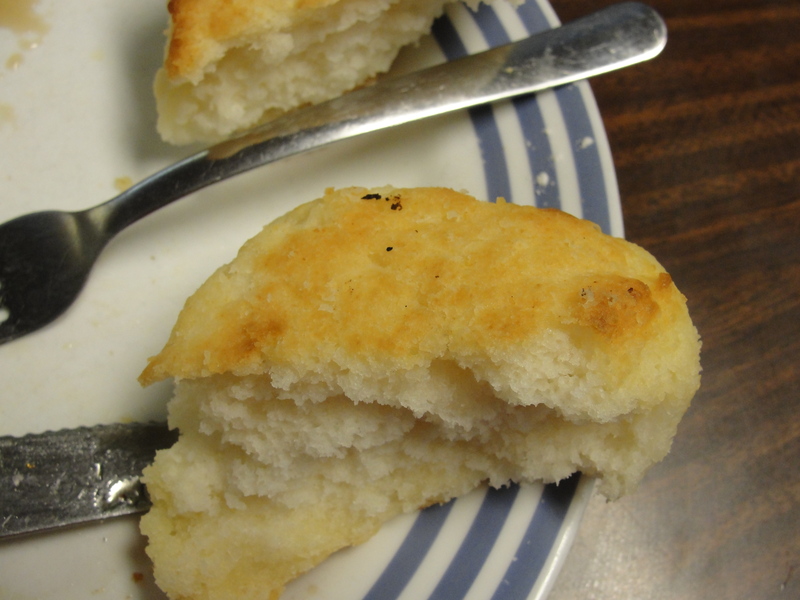 This biscuit was extra fluffy with a hearty taste and consistency to it. I did even dip one piece into some left over syrup. While syrup is good and biscuits are good, the combination of the two is not very good. After pounding down the french toast, and then this delicious biscuit, I was beyond full. I’m not really sure why this was our first visit to the Blairsville Restaurant but, if we have to go out for breakfast again, I would definitely come back here. While I will never proclaim myself to be a breakfast person, this was by far some of the best french toast I have ever had. From start to finish, each and every bite delivered consistent flavor. And, not only was it consistent, but, it was consistently good. I can say the same about the biscuit and the rest of the fam enjoyed their meal as well. Just remember, if you do make a visit into the Blairsville Restaurant, be sure to wear your bell bottoms and platform shoes. This may be 2012 but, the Blairsville Restaurant will Transport you Back in time.